Lenore : Noogies Color Edition by Roman Dirge is a newly released graphic novel, which is a collection of the original Lenore comics in color for the first time. Thanks to Titan Books, I have three copies of Lenore : Noogies Color Edition (Hardcover) to giveaway. Leave a comment about Lenore Comics or tell me what book you think would make a good comic. For an extra entry, spread the word about this giveaway: Blog, Facebook, Twitter, etc. - leave a link in the comments. Leave your email with your comment if it is NOT part of your profile. This giveaway is open to the US and Canada only. Contest ends on Saturday, October 24th at Midnight CST. Lenore : Noogies will be mailed from Titan Books to the winners. Take a trip into the dark, surreal world of a little dead girl with a knack for (often) unintentional mayhem in this remastered, gothic classic, newly-coloured and presented in glorious hardcover! A massive cult hit on both sides of the Atlantic, Lenore is one of the funniest, darkest, cutest, creepiest characters on the marketplace today. Roman Dirge created Lenore in 1992 for the San Diego alternative magazine Xenophobe. In 1997 he launched the Lenore comic in the US, which quickly became a publishing phenomenon. Currently Roman is working on new Lenore adventures, as well as new character Samurai Sloth. I love the name Lenore. The Game of Thrones by George R.R. Martin would make a great graphic novel. No need to enter me on this one. :) Her barrettes are clever! I haven't read any of the Lenore comics but have always wanted to since I remember some people talking about them on an art forum a few years back. But I couldn't find any locally (small town) and actually forgot about it until I saw this post. I would really like to win this! Please enter my name! I think Rachel Caine's Morganville Vampires series would make a really good comic. I've wanted to read Lenore for a long time, but never did! I love love love the cover! It makes me want to open it and see the rest! This looks so cute. And I love the name Lenore. It makes me think of Poe, but for some reason, I always end up with the Annabelle Lee poem in my head...Weird. How about The Vampire Diaries? I know a couple of teenager girls that would too. I used to use a Lenora avatar in a forum she was just so darn cute! I always wanted to read Death Bed to see what her pets had to say about her always killing her them. Oh man I love Lenore and Ragmuffin! One of my favorite comics!! I love Roman's work. I don't know why, but I can totally see the brief, wondrous life of oscar wao making a hilarious comic! She looks soo grimly cute!!! I love it!!! I really want try out the series now...had no idea that it was so big a craze! I haven't read any Lenore comics but I really like the cover artwork so am interested in seeing more from the book. I love Lenore comics! I have some Lenore stuff in Second Life :) Very cool! 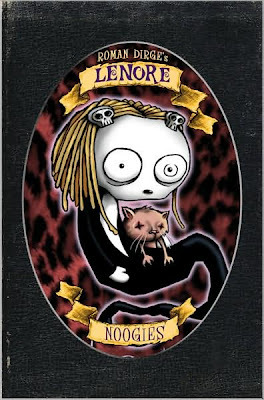 I wish I had a Lenore doll to give to my kids! Thanks for the coolest of cool giveaways!! I have read Lenore yet, but it looks great. The books (series) that I think would make an excellent graphic novels are Mario Acevedo's Felix Gomez Series. Excellent series to move to graphic novels. I posted your contest on my sidebar. We likes, I wants... Gimmie! I think Richelle Mead's Vampire Academy series would do well as graphic novels. I've read a few of these years ago, and would love to get my hands on the set. Oh, definitely throw my name in for this. It's right up my alley. Have you read the Dungeon series, by Joann Sfar and Lewis Trondheim? Oh, I love it -- I suspect you would, too. And thanks for the e-mail. I've got this posted at Win a Book for you. I think Neil Gaiman's Neverwhere would be a good GN. IS IT in GN form somewhere? I don't have any of these yet but th book looks great. Would love to win it. I have to say, please pick me! I started reading the Lenore comics from the beginning, and then fell out of the collecting comics habit so a graphic novel is really a great idea! 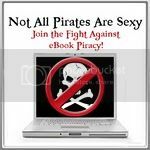 I've read a couple of the graphic novels of books (Guilty Pleasures and the Color of Magic), so I think that an action book works a bit better. Colors in the Dreamweavers Loom by Beth Hilgartner would be a good novel to try. It is a quest novel, which is a good format for that kind of thing. I've added this contest to my twitter (http://www.twitter.com/qarylla). Ilona Andrews' Kate Daniels book series would make a good comics.